And this, friends, would be an example of an AHubb meal. Or, an AHubb meal following a couple of weeks of BHubb meals, multiple food-centered editorial assignments, and a day-long photoshoot involving roughly 800oz of potato chips. Which, yes, we kept and distributed [mostly] to friends and family. With the fast approach of the holiday season and even heavier meals for impending Winter days, I've decided to challenge myself to create an interesting salad each week. To keep me on track, grounded, and hopefully in my current jeans. Not that I'll share each of them here. I know...you all really enjoy recipes more closely aligned with orecchiette carbonara and peach cakes. Who doesn't? But I thought, maybe, some of you might appreciate a few healthier options sprinkled here and there. We all have those days when our jeans fit just a little tighter than the last, when we are craving something complex and hearty and cheesy for lunch but know we should choose the green salad instead. This recipe is my compromise. With a healthy dose of greens and apples, and a modest sprinkling of blue cheese and candied walnuts, it satisfies without the guilt. 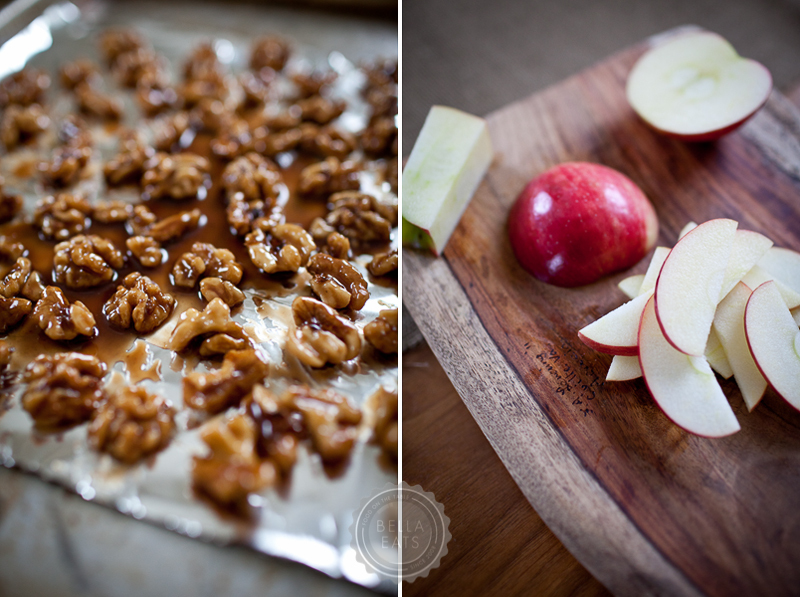 Make it lighter by omitting the candied walnuts and just sprinkling them on raw...but gosh, they sure are tasty. 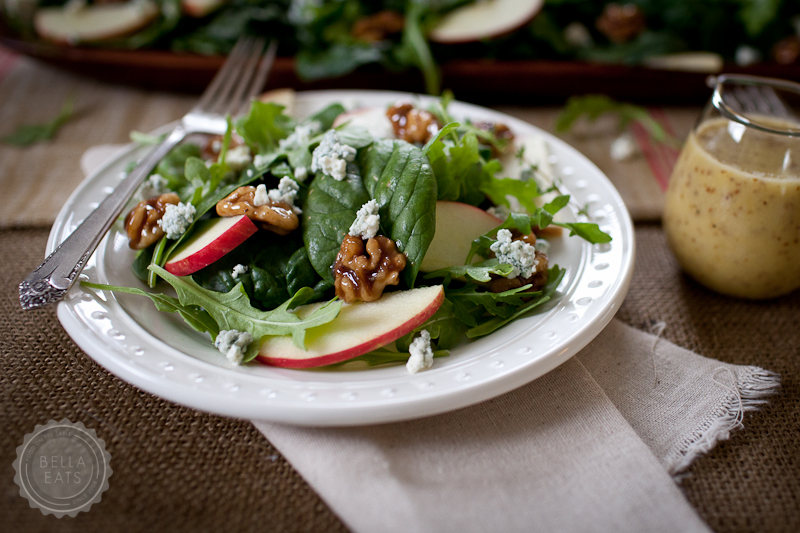 The combination of apples, blue cheese, and candied walnuts is well-loved and known for salads. Sometimes you just need a little reminder about an old favorite. First, candy the walnuts. Combine the first 4 ingredients in a heavy skillet. Bring to a boil, whisking, and allow to boil for 1 minute. Add the walnuts and stir to coat. Continue tossing until the syrup forms a glaze on the nuts, about 3 minutes. Transfer nuts to sheet of foil and quickly separate them with forks. Second, make the vinaigrette. Combine the mustard, vinegar, and honey in the small bowl of a food processor. Pulse to combine. With the processor running, slowly add the olive oil to emulsify, processing for about 1 minute. Toss together the spinach and arugula. Place in a shallow serving dish. Add the apples and walnuts evenly across the top of the greens, then the crumbled blue cheese. Dress the salad on individual plates.